Wedding themes are a great way to make your wedding unique. If your big day is coming up soon and you need help with a theme, you've come to the right place! 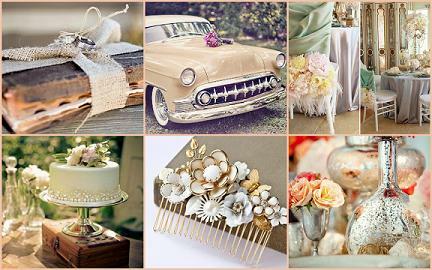 I love planning a very theme heavy wedding, the shopping and planning can actually be a lot of fun. Be careful though, because as fun as wedding themes are, you can take it too far, and it can go from chic to cheesy pretty fast. Let's make sure that doesn't happen by following a few simple rules of decorating. If the general decor has a theme, I think that can be fabulous. 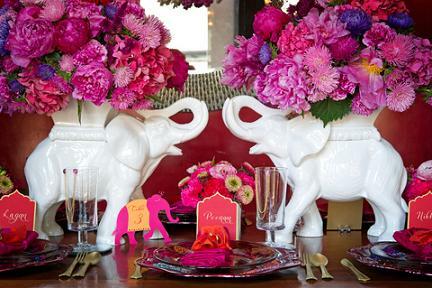 If every detail is themed, then you've probably crossed over to the dark side of wedding decorations. Have you ever been into a party store? These places have matching everything: tiki torches, grass skirts, hawaiian shirts, flip flops, hats, bamboo cups, bamboo bowls, every item you pick up has a Hawaiian print. This might be fun for a kids party, but NOT for a romantic wedding. Now if you went to a Hawaiian themed wedding at the beach, and the aisle was lined with Tiki torches and tropical flowers, and the reception showcased gorgeous seashell themed centerpieces, with flickering candles, you'd be left with an impression of an elegant and exotic affair. Put together an inspiration board and make sure that at least 50% of your design elements are not directly related to the "theme". You can match your items color wise, but be more subdued with your theme elements. Coco Chanel had a famous quote about fashion applies well when choosing wedding themes, Before you leave the house, take one thing off. So if you want to stick peacock feathers, for your peacock theme, on your cake, chairs, napkin rings, and centerpieces, maybe just go with one less item. Apply the less-is-more approach to your wedding decorations and you will have an incredibly successful event. You don't want to fall in love with a theme only to find out that executing it will be darn near impossible. If you have your heart set on a tree fairy-orchid-rainbow theme, by all means, go for it. But just remember stores stock items according to demand, and there just may not be many other brides shopping for a tree fairy-orchid-rainbow theme, so you'll be making extra work for yourself trying to locate the stuff you'll need to pull it off. Some wedding themes allow you to tie in non-decorative elements, like the music and the food easily, others will be more difficult to pin down. Give yourself several options to choose from and play around with several ideas for each one. Visual cues like magazine clippings, swatches or photos are invaluable, and will help you narrow down the perfect theme for you. You may decide to keep the wedding "theme free" and instead focus your wedding theme ideas on your wedding reception. There is a big difference as far as I am concerned, and a theme can even make your reception a lot more fun. Ready to begin? Take your time looking over some of my favorite wedding themes, and see if one is a good fit for you. At the very least you'll have a wealth of ideas to get you started planning your dream wedding.